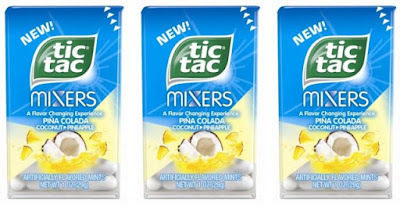 Tic Tac looks forward to the warm summer months with the release of new Pina Colada Tic Tac Mixers mints. The Mixers line consists of layered, dual-flavored mints where the outer layer is one flavor and the inner layer is another. Here the mints features coconut first and then pineapple. You can find Pina Colada Tic Tacs nationwide in 60-piece containers. Other Tic Tac Mixers flavors include Cherry Cola and Peach Lemonade.